Moon Harbour is meant to inaugurate its distillery in June 2017 – just in time for world-famous wine & spirits fair Vinexpo – Born in the South-west and having pursued my college education in Bordeaux, I was more than curious to find out more about this French whisky adventure! The Moon Harbour project was born out of a friendship between two men, both passionate about the multiple flavors of whisky and deeply attached to their home region. Some could say it was probably their destinies to meet in 1986, on the banks of the Garonne River in the Chartrons neighborhood, a historical area in Bordeaux specialized in wine barrels export… The rest is history! Ever since that year, curious and meticulous, Jean-Philippe and Yves have been spending hours together tasting whiskies and bourbons from a variety of places. It therefore appeared almost natural for them to embark on that malted adventure, for which their experiences in national and international business helped a lot. Since 2012, the two friends have been conducting multiple researches and finally decided to turn their dream into reality! To provide their future whisky with unique taste, Yves and Jean-Philippe seeked the help of one the best whisky experts around: John McDougall. He is known as the only Master Blender & Master Distiller in the world and is undeniably one of the most experienced! Amongst other, John managed Springbank, The Balvenie & Laphroaig while being involved in many distillery projects such as Kilchoman and the Blackwood Distillery on The Shetlands islands. So why deciding to name the distillery “Moon Harbour”? This name simply is the litteral translation of “Port de la Lune”: the poetic nickname given to Bordeaux’s harbour, refering to the notable crescent shape the Garonne river draws when passing through the city. By sticking this very “Bordelais” label on their whiskies, Moon Habour is willing to showcase the savoir-faire of the well-known French city, which goes far beyond wine & cannelés! FUN FACT! 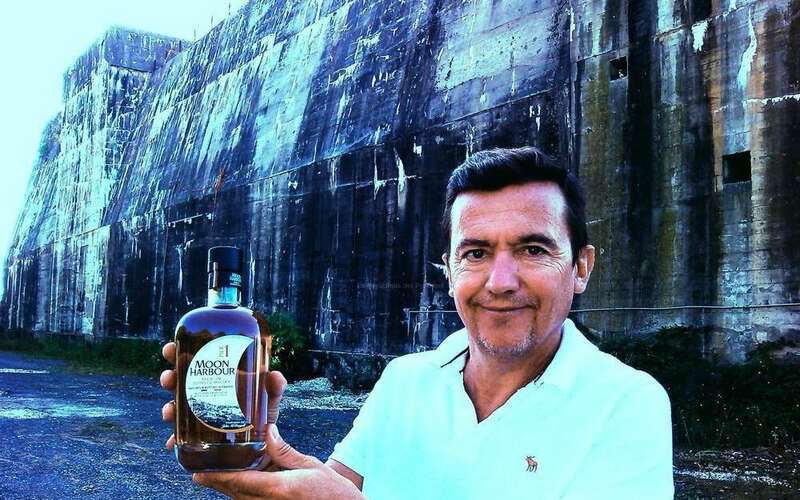 A distillery in an ancient bunker! In order to make the distillery a true part of the local heritage, Moon Harbour has chosen to implant its distillery at the very heart of the Great Seaport of Bordeaux, an area currently undergoing a huge economic and social renovation. This new construction will also allow a historic building to be refurbished: a former bunker that was built by the Germans during World War II. Of course, Bordeaux and its surrounding area is mainly famous for its great wine terroir. Jean-Philippe and Yves are then willing to produce a whisky with an authentic but unique regional identity. Raw materials will be sourced from regional agriculture: corn and barley cultivated in the Gironde or in the Landes region. Today, cereals have already been planted in Saint Jean d’Illac for future production. Stills are currently being built in Bordeaux by Mr. Stupfler, whose company has been perpetuating the tradition of beautiful and original copper work since 1925. When it comes to maturation, Moon Harbour is willing to solely use barrels from regional crus such as Sauternes and red wine “grands crus”.